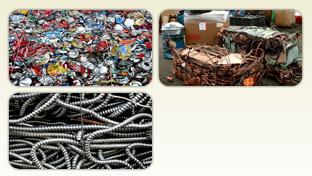 We Buy All Types Of Scrap Metal. We pay top dollar for both ferrous and non-ferrous scrap metals. Small Business to Big Business. We Have Your Recycling Needs covered. We pay for non-ferrous metals such as copper, aluminum, and brass. The recycling process begins with each of us. Many items you throw away can be recycled, but all too often it goes in the trash! You may even get CASH for recycling! We cater to both residential customers with small amounts of household items as well as commercial customers with larger amounts. Please call us for the latest pricing information as well as materials accepted but not purchased. We accept cardboard, but DO NOT pay you for it or charge you to accept it. Note: we ask that material brought into the recycling center be sorted and free of contaminants.